Notts County boss Mark Cooper is holding up the table-topping Cobblers as the example to his players of what they are capable of achieving next season. Cooper has only been in charge at Meadow Lane for two matches and County arrive at Sixfields stuck in mid-table with no chance of going up or down, but the former Kettering Town boss is already planning for the future. Cooper is a huge admirer of the way Northampton have performed this season, says they are ‘the best team in the league’, and will be stressing to his players the Cobblers have set the standards they must reach in the future. 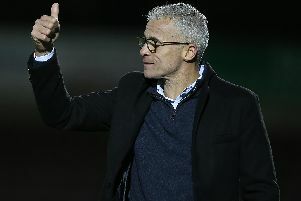 “I will be saying to our players ‘this should be you - you should be in this position’,” said Cooper, who has also managed Peterborough United and Swindon Town, among others. “Maybe next year it might be us, where we are potentially one game away from getting promoted, and that is what we have to strive towards to get that success. And he added: “I think Northampton have a group of incredibly focused professionals who know their jobs, and they do the basics right to start with. “Then at the top end of the pitch they have some individuals that know how to win games and score goals, players like Ricky Holmes, James Collins, Marc Richards, Lee Martin, the kind of players that can hurt you. “If you have a solid base to work from, you know that somewhere along the line that those boys are going to create you something nine times out of 10. Notts are in a dismal run of form and haven’t won since February 16. Cooper’s first game in charge after taking over from Jamie Fullarton, who was sacked earlier this month having only been appointed in January, was a 4-0 pasting at Portsmouth. But on Easter Monday there were more encouraging signs in a 0-0 draw with Wycombe Wanderers, and the manager is expecting his players to rise to the challenge against the Cobblers. “The players should be relishing going to Sixfields on Saturday and relishing the challenge of playing in front of what will be a full house and a brilliant atmosphere,” said Cooper. “They should relish pitching themselves against what are going to be the champions of the league this year. “Northampton have done remarkably well, but sometimes it is good to play teams like that. “It’s a game where we are not really expected to get too much, so we can go and express ourselves a little bit. “We will go there with a bit of hope and encouragement after the game on Monday and we are looking forward to it, although it is a tough ask. “Northampton have done brilliantly this season and won an incredible amount of games. The Cobblers have a chance of clinching promotion on Saturday. “I have played in games where you have a chance of being promoted, and you feel the tension, you feel the crowd, and other results are happening as the game goes on,” said Cooper. “It can become tense, but what does happen is you seem to get the rub of the green, you get a lot of the decisions, and it always seems to happen for you, so we have to be really on our guard. “We have to really focus and concentrate to have any chance of getting anything. “The players have set their standard with their desire and attitude on Monday, and they have to take that forward now. “We have to try and get a couple of wins now, and there is no better place to start than by going and spoiling Northampton’s party.